Until now, scientists have had no accurate way of knowing the long-term history of the glacier. 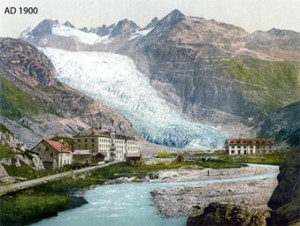 Local records of the ice date back to 1602, and it is clear that the Rhone, like other glaciers in the Alps, has retreated dramatically in the past 150 years. This melting has exposed intriguing clues – remnants of trees from once-forested land, and artifacts of human settlements dating back thousands of years, to times when even more of the land was uncovered and green. A team of researchers led by two scientists from the Lamont-Doherty Earth Observatory have found a novel method to measure this crucial back-and-forth, by measuring isotopes in hunks of stone chipped out from recently exposed bedrock near the edge of the ice. They found that for most of the Holocene Epoch, dating from the end of the last ice age about 11,500 years ago to the present, the Rhone Glacier has been smaller than it is today. In a paper published last month in the journal Geology, the researchers said that their more robust history of the Holocene glacier fluctuations reflects how sensitive glaciers are to small changes in climate. And, they said, the new method they used to measure glacial movement may allow scientists to make more accurate predictions of what will happen as the earth continues to warm. The findings “may potentially open up our work to application globally at many different glaciers, to begin to piece together a global picture of Holocene glacier advance and retreat,” said lead investigator Brent Goehring, a former PhD student at Lamont and now a post-doctoral researcher at Pennsylvania State University. Co-author Joerg Schaefer, a geochemist and Lamont associate research professor, is concerned the findings could be misinterpreted by skeptics of climate change. They might conclude that, if the glacier is larger than it has been over most of the time during the past several thousand years, then there is little to worry about today. “Which is simply wrong,” Schaefer said. The researchers chiseled samples from bedrock that had been scraped and scoured over time by the glacier, and most recently exposed in 2005-2006 by the retreating glacier. They pulverized the stone in the lab and measured the isotopes Carbon 14 and Beryllium 10, which were formed in grains of quartz when the ice melted back and the rock became exposed to cosmic rays. This new technique allowed them to calculate how much time the rock had been exposed during the Holocene. The study is the first to offer such detailed evidence of the glacial back-and-forth during the Holocene, Schaefer said, unlike previous studies that have relied on tree rings, glacial moraines and lake sediments. The Swiss Alps record contrasts with the record of glacial movements in the Southern Alps of New Zealand, where the glaciers appear to have been larger than at present for most of the Holocene. That difference offers important clues about the evolution of summer temperatures in mid-latitudes of the Northern and Southern hemispheres, he said. Goehring hopes to use the cosmogenic dating techniques elsewhere, including Norway. There are numerous records, he said, of farms and farmhouses there being overrun by ice during the unusually cold period known as the “Little Ice Age,” which continued into the mid-19th century.